The plugin allows your specified usergroups to report a user's profile. This may help to prevent profile spam. - Ability to add reason for the Profile Report. - Ability to perform various actions e.g. Editing his profile, banning, using good bye spammer tool or marking the report as cleared. - A red notice appears in header whenever there is a new report, it shows only to admins though. - The number of reports shown in the red notice. 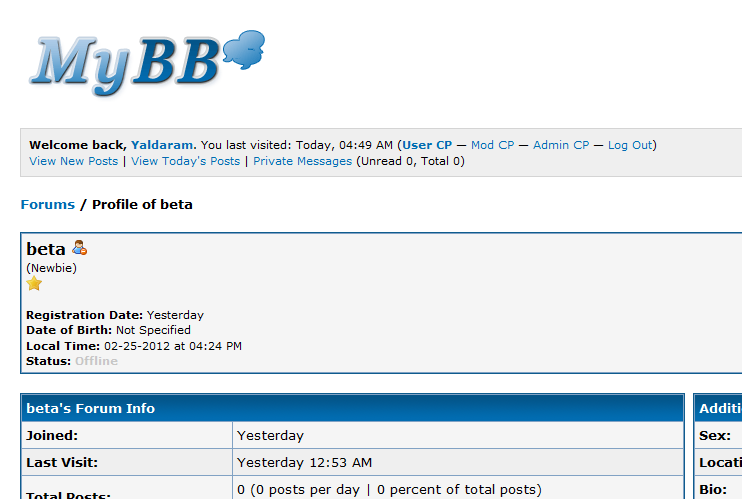 You may notice that spam is becoming worse day by day across MyBB forums. The human or non-human spam/bots try to spam your forum in many different ways. Some may use the profile fields to leave their spam website links or any other relevant data. The traces of spam links leaving behind works like a magnet to attract more spam bots to attack your website. So profile is one of hit-list for spammers. This plugin allow specific usergroups to Report any of such profile with ease. However they're not able to report a same person twice. Also if a person is already reported then no one will report him/her again (Until you mark his/her profile as Clear). - Edit the person's profile. - If you think that reporting is just fake or the person is not a spammer then you'll simply Mark the Reported Profile as Clear. 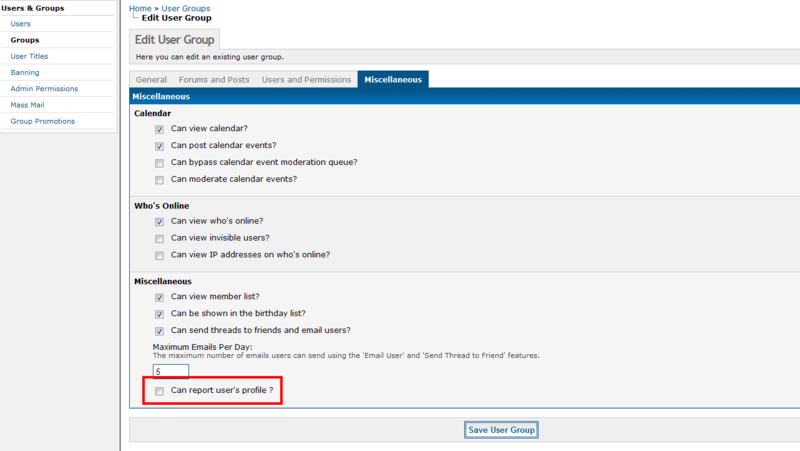 Usergroup editing page where you can allow/disallow to report profile for that particular usergroup. The small image, by clicking to this will redirect reporter to the Report Page. The Report page, the reporter must have to enter a reason for reporting and it shouldn't exceed beyond 250 words limit. The ModCP page, here you (as admin) control various options mentioned in "Features" overview. The red notice, note the "number of reported profile(s)". There are one plugin file in ./inc/plugins/ folder and 5 images in ./images/profile_report/ folder. Upload the .zip archive in your forum's root folder > Extract > Go to Plugin's Manager in AdminCP > Activate the Plugin. Now a Checkbox appears in: AdminCP > Users and Groups > Groups > Edit each usergroup > Under "Miscellaneous" tab > "Can report user's profile ?" By ticking this checkbox you are allowing that usergroup to Report anyone's profile. By default the checkbox has been already marked as ticked.